For the musical written by Oscar Hammerstein II and Jerome Kern, see Three Sisters (musical). "Tri sestry" redirects here. For Czech punk rock band, see Tři sestry. For the opera by Péter Eötvös, see Tri sestry (opera). Chekhov in a 1905 illustration. 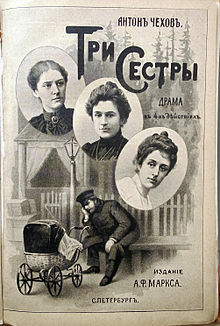 Three Sisters (Russian: Три сeстры́, translit. 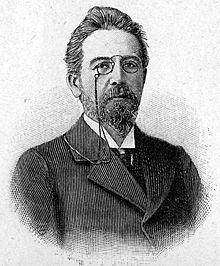 Tri sestry) is a play by the Russian author and playwright Anton Chekhov. It was written in 1900 and first performed in 1901 at the Moscow Art Theatre. The play is sometimes included on the short list of Chekhov's outstanding plays, along with The Cherry Orchard, The Seagull and Uncle Vanya. Olga Sergeyevna Prozorova (Olga) – The eldest of the three sisters, she is the matriarchal figure of the Prozorov family though at the beginning of the play she is only 28 years old. Olga is a teacher at the high school, where she frequently fills in for the headmistress whenever the latter is absent. Olga is a spinster and at one point tells Irina that she would have married "any man, even an old man if he had asked" her. Olga is very motherly even to the elderly servants, keeping on the elderly nurse/retainer Anfisa, long after she has ceased to be useful. When Olga reluctantly takes the role of headmistress permanently, she takes Anfisa with her to escape the clutches of the heartless Natasha. Maria Sergeyevna Kulygina (Masha) – The middle sister, she is 23 at the beginning of the play. She married her husband, Kulygin, when she was 18 and just out of school. When the play opens she has been disappointed in the marriage and falls completely in love with the idealistic Lieutenant-Colonel Vershinin. They begin a clandestine affair. When he is transferred away, she is crushed, but returns to life with her husband, who accepts her back despite knowing what she has done. She has a short temper, which is seen frequently throughout the play, and is the sister who disapproves the most of Natasha. Onstage, her directness often serves as a tonic to the melodrama, and her wit comes across as heroic. Her vitality provides most of the play's surprisingly plentiful humour. She was trained as a concert pianist. Irina Sergeyevna Prozorova – The youngest sister, she is 20 at the beginning of the play. It is her "name day" at the beginning of the play and though she insists she is grown-up she is still enchanted by things such as a spinning top brought to her by Fedotik. Her only desire is to go back to Moscow, which they left eleven years before the play begins. She believes she will find her true love in Moscow, but when it becomes clear that they are not going to Moscow, she agrees to marry the Baron Tuzenbach, whom she admires but does not love. She gets her teaching degree and plans to leave with the Baron, but he is shot and killed by Solyony in a pointless duel. She decides to leave anyway and dedicate her life to work and service. Andrei Sergeyevich Prozorov (Andrey) – The brother of the three sisters. In Act I, he is a young man on the fast track to being a Professor in Moscow. In Act II, Andrei still longs for his old days as a bachelor dreaming of life in Moscow, but is now, due to his ill-conceived wedding to Natasha, stuck in a provincial town with a baby and a job as secretary to the County Council. In Act III, his debts have grown to 35,000 rubles and he is forced to mortgage the house, but does not tell his sisters or give them any shares in the family home. Act IV finds Andrei a pathetic shell of his former self, now the father of two. He acknowledges he is a failure and laughed at in town for being a member of the village council whose president, Protopopov, is cuckolding him. Natalia Ivanovna (Natasha) – Andrei's love interest at the start of the play, later his wife. She begins the play as an awkward young woman who dresses poorly and hides her true nature. Much fun is made of her ill-becoming green sash by the sisters, and she bursts into tears. She apparently has no family of her own and the reader never learns her maiden name. Act II finds a very different Natasha. She has grown bossy and uses her relationship with Andrei as a way of manipulating the sisters into doing what she wants. She has begun an affair with Protopopov, the head of the local council (who is never seen), and cuckolds Andrei almost flagrantly. In Act III, she has become even more controlling, confronting Olga head on about keeping on Anfisa, the elderly, loyal retainer, whom she orders to stand in her presence, and throwing temper tantrums when she doesn't get her way. Act IV finds that she has inherited control of the house from her weak, vacillating husband, leaving the sisters dependent on her, and, as the châtelaine, planning to radically change the grounds to her liking. It is arguable that the vicious, manipulative, self-absorbed Natasha, who cares for no one besides her own children, Bobik and Sofia, upon whom she dotes fatuously, is the complete victor by the end of the play. Fyodor Ilyich Kulygin – Masha's older husband and the Latin teacher at the high school. Kulygin is a jovial, kindly man, who truly loves his wife, and her sisters, although he is very much aware of her infidelity. In the first act he seems almost foolish, giving Irina a gift he has already given her, and joking around with the doctor to make fun of Natasha, but begins to grow more and more sympathetic as Masha's affair progresses. During the fire in Act 3, he confesses to Olga that he might have married her – the fact that the two would probably be very happy together is hinted at many times throughout the show. Throughout the show, often at the most serious moments, he often tries to make the other characters laugh in order to relieve tension, and while that doesn't always work, he is able to give his wife comfort through humor in her darkest hour at the show's climax. At the end of the play, although knowing what Masha had been doing, he takes her back and accepts her failings. Aleksandr Ignatyevich Vershinin – Lieutenant colonel commanding the artillery battery, Vershinin is a true philosopher. He knew the girls' father in Moscow and they talk about how when they were little they called him the "Lovesick Major". In the course of the play, despite being married, he enters into an affair with Masha but must end it when the battery is transferred. He frequently mentions how his wife regularly attempts suicide (and he has two daughters), but he seems to not care. His first act speech about the hope he has for civilization speaks directly to Masha's melancholic heart, and, upon hearing it, she declares "I'm staying for lunch." Baron Nikolaj Lvovich Tuzenbach – A lieutenant in the army and not deemed handsome, Tuzenbach often tries to impress Irina, whom he has loved for five years. He quits the Army to go to work in an attempt to impress her. He is repeatedly taunted by Solyony and between Acts III and IV, he retaliates and prompts Solyony to declare a duel. He is killed in the duel, thus his and Irina's union is forlorn. Staff Captain Vassily Vasilyevich Solyony – A captain in the army, Solyony is a social misfit and a rather modern type of antihero. He is in love with Irina and tries to put down the Baron to make himself look better, but Irina finds him crude and unappealing. He spends much of his time mocking the Baron, who is the closest thing he has to a friend, and ends up killing him in a pointless duel. He is said to have a remarkable resemblance to the poet Lermontov in both face and personality, often quoting him. He always carries a small perfume bottle which he frequently (almost pathologically) sprinkles his hands and body with; it is later revealed that he does it to mask the smell of corpses on him. Ivan Romanovich Chebutykin – Sixty years old and an army doctor, Chebutykin starts off as a fun, eccentric old man who exults in his place as family friend and lavishes upon Irina the expensive gift of a samovar. Later on in Act III, while drunk, he suffers an existential crisis and reveals to all about Natasha's and Protopopov's affair. In Act IV however, he seems to have come to terms with his crisis or perhaps been broken by it. He loved the mother of the sisters (whose name is never mentioned) but she was married. Aleksej Petrovich Fedotik – A sub-lieutenant, Fedotik hangs around the house and tries to express his love to Irina by buying her many gifts. He also is an amateur photographer, and takes photos of the group and Irina. In Act III, he loses all his belongings in the fire, but retains his cheerful nature. 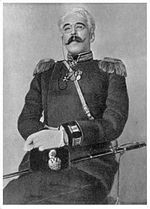 Vladimir Karlovich Rode – Another sub-lieutenant, Rode is a drill coach at the high school. Ferapont – Door-keeper at the local council offices, Ferapont is an old man with a partial hearing loss. He repeatedly blurts out random facts, usually relating to Moscow. Anfisa – An elderly family retainer and former nurse, Anfisa is 81 years old and has worked forever for the Prozorov family. Natasha begins to despise her for her feebleness and threatens to throw her out but Olga rescues her, taking her to live at Olga's teacher's flat. The play has several important characters who are talked about frequently, but never seen onstage. These include Protopopov, head of the local Council and Natasha's lover; Vershinin's suicidal wife and two daughters; Kulygin's beloved superior the headmaster of the high school and Andrey and Natasha's children Bobik and Sofia. JL Styan contends in his The Elements of Drama that in the last act Chekhov revised the text to show that Protopopov is the real father of Sofia: "The children are to be tended by their respective fathers"—Andrey pushes Bobik in his pram, and Protopopov sits with Sofia. Act one begins with Olga (the eldest sister) working as a teacher in a school, but at the end of the play she is made headmistress, a promotion in which she had little interest. Masha, the middle sister and the artist of the family (she was trained as a concert pianist), is married to Feodor Ilyich Kulygin, a schoolteacher. At the time of their marriage, Masha, younger than he, was enchanted by what she took to be wisdom, but seven years later, she sees through his pedantry and his clownish attempts to compensate for the emptiness between them. Irina, the youngest sister, is still full of expectation. She speaks of her dream of going to Moscow and meeting her true love. It was in Moscow that the sisters grew up, and they all long to return to the sophistication and happiness of that time. Andrei is the only boy in the family and the sisters idolize him. He is in love with Natalia Ivanovna (Natasha), who is somewhat common in relation to the sisters and suffers under their glance. The play begins on the first anniversary of their father's death, but it is also Irina's name-day, and everyone, including the soldiers (led by the gallant Vershinin) bringing with them a sense of noble idealism, comes together to celebrate it. At the very close of the act, Andrei exultantly confesses his feelings to Natasha in private and fatefully asks her to marry him. Act two begins almost a year later with Andrei and Natasha married with their first child (offstage), a baby boy named Bobik. Natasha is having an affair with Protopopov, Andrei's superior, a character who is mentioned but never seen onstage. Masha comes home flushed from a night out, and it is clear that she and her companion, Lieutenant-Colonel Vershinin, are giddy with the secret of their mutual love for one another. Little seems to happen but that Natasha manipulatively quashes the plans for a party in the home, but the resultant quiet suggests that all gaiety is being quashed as well. Tuzenbach and Solyony both declare their love for Irina. Act three takes place about a year later in Olga and Irina's room (a clear sign that Natasha is taking over the household as she asked them to share rooms so that her child could have a different room). There has been a fire in the town, and, in the crisis, people are passing in and out of the room, carrying blankets and clothes to give aid. Olga, Masha and Irina are angry with their brother, Andrei, for mortgaging their home, keeping the money to pay off his gambling debts and conceding all his power to his wife. However, when faced with Natasha's cruelty to their aged family retainer, Anfisa, Olga's own best efforts to stand up to Natasha come to naught. Masha, alone with her sisters, confides in them her romance with Vershinin ("I love, love, love that man"). At one point, Kulygin (her husband) blunders into the room, doting ever more foolishly on her, and she stalks out. Irina despairs at the common turn her life has taken, the life of a municipal worker, even as she rails at the folly of her aspirations and her education ("I can't remember the Italian for 'window'"). Out of her resignation, supported in this by Olga's realistic outlook, Irina decides to accept Tuzenbach's offer of marriage even though she does not love him. Chebutykin drunkenly stumbles and smashes a clock which had belonged to the Prozorov siblings' late mother, whom he loved. Andrei then vents his self-hatred, acknowledges his own awareness of life's folly and his disappointment in Natasha, and begs his sisters' forgiveness for everything. In the fourth and final act, outdoors behind the home, the soldiers, who by now are friends of the family, are preparing to leave the area. A flash-photograph is taken. There is an undercurrent of tension because Solyony has challenged the Baron (Tuzenbach) to a duel, but Tuzenbach is intent on hiding it from Irina. He and Irina share a heartbreaking delicate scene in which she confesses that she cannot love him, likening her heart to a piano whose key has been lost. Just as the soldiers are leaving, a shot is heard, and Tuzenbach's death in the duel is announced shortly before the end of the play. Masha has to be pulled, sobbing, from Vershinin's arms, but her husband willingly, compassionately and all too generously accepts her back, no questions asked. Olga has reluctantly accepted the position of permanent headmistress of the school where she teaches and is moving out. She is taking Anfisa with her, thus rescuing the elderly woman from Natasha. Irina's fate is uncertain but, even in her grief at Tuzenbach's death, she wants to persevere in her work as a teacher. Natasha remains as the chatelaine, in charge and in control of everything. Andrei is stuck in his marriage with two children, the only people that Natasha cares about, besides herself. As the play closes, the three sisters stand in a desperate embrace, gazing off as the soldiers depart to the sound of a band's gay march. As Chebutykin sings Ta-ra-ra-boom-di-ay to himself,[nb 1] Olga's final lines call out for an end to the confusion all three feel at life's sufferings and joy: "If we only knew... If we only knew". The play was written for the Moscow Art Theatre and it opened on 31 January 1901, under the direction of Konstantin Stanislavski and Vladimir Nemirovich-Danchenko. Stanislavski played Vershinin and the sisters were Olga Knipper (for whom Chekhov wrote the part of Masha), Margarita Savitskaya as Olga and Maria Andreyeva as Irina. Maria Lilina (Stanislavski's wife) was Natasha, Vsevolod Meyerhold appeared as Tusenbach, Mikhail Gromov as Solyony,[nb 2] Alexander Artyom as Artem Chebutykin, Ioasaf Tikhomirov as Fedotik, Ivan Moskvin as Rode, Vladimir Gribunin as Ferapont, and Maria Samarova as Anfisa. Reception was mixed. Chekhov felt that Stanislavski's "exuberant" direction had masked the subtleties of the work and that only Knipper had shown her character developing in the manner the playwright had intended. In the directors' view, the point was to show the hopes, aspirations and dreams of the characters, but audiences were affected by the pathos of the sisters' loneliness and desperation and by their eventual, uncomplaining acceptance of their situation. Nonetheless the piece proved popular and soon it became established in the company's repertoire. 12 January – 6 March 2011 Classic Stage Company, NYC Austin Pendleton Real-life husband and wife actors Maggie Gyllenhaal and Peter Sarsgaard starred. John Gielgud's 1936–37 landmark season at the Queen's Theatre included a well-received production with Peggy Ashcroft as Irina and Michael Redgrave as Tusenbach. In 1942, Judith Anderson portrayed Olga, Katharine Cornell portrayed Masha, Gertrude Musgrove portrayed Irina, and Ruth Gordon portrayed Natasha on Broadway. The production was significant enough to land the cast on the cover of Time on 21 December 1942, which proclaimed it "a dream production by anybody's reckoning – the most glittering cast the theatre has seen, commercially, in this generation". The 1963 inaugural season of the Guthrie Theater included a production with Jessica Tandy as Olga. There is a filmed record of a mid-1960s production by The Actors Studio with Kim Stanley and Geraldine Page as Masha and Olga, respectively, supported by Sandy Dennis's Irina and Shelley Winters as Natasha. American Film Theatre in 1970 filmed a version with a witty Masha from Joan Plowright opposite Alan Bates as Vershinin, with Ronald Pickup as Tusenbach and Laurence Olivier, who co-directed, playing Chebutykin. The film was based on a theatre production that Olivier directed at the Royal National Theatre in 1967. Rosemary Harris, Ellen Burstyn and Tovah Feldshuh played, respectively, Olga, Masha and Irina at the Brooklyn Academy of Music in the 1970s with René Auberjonois as Solyony. A 1982 production at Manhattan Theatre Club, had Dianne Wiest as Masha, Lisa Banes as Olga, Mia Dillon as Irina, Christine Ebersole as Natasha, Sam Waterston as Vershinin, Jeff Daniels as Andrei, Bob Balaban as Tusenbach, and Jack Gilford as Chebutykin. Chicago's Steppenwolf Theatre Company put one together under the direction of Austin Pendleton, with Molly Regan as Olga, Joan Allen as Masha, Rondi Reed as Natasha, and Kevin Anderson as Solyony. In 1985 Casper Wrede directed a production at the Royal Exchange, Manchester with Cheryl Prime as Natasha, Emma Piper as Olga, Janet McTeer as Masha, Niamh Cusack as Irina and Espen Skjonberg as Dr Chebutykin. The Roundabout Theatre in New York had Jerry Stiller as Chebutykin, Billy Crudup as Solyony, Eric Stoltz as Tuzenbach, Lili Taylor as Irina, Paul Giamatti as Andrei, Amy Irving as Olga, Jeanne Tripplehorn as Masha, Calista Flockhart as Natasha, and David Strathairn as Vershinin. In 1990, the play opened at the Gate Theatre in Dublin with locally-born sisters Sinéad, Sorcha and Niamh Cusack in the title rôles and their father Cyril Cusack as Dr. Chebutykin. In 1991, sisters Vanessa Redgrave (Olga) and Lynn Redgrave (Masha) made their first and only appearance together onstage in this, with niece Jemma Redgrave as Irina at the Queen's Theatre, London. The play was produced in 2010 at the Lyric Hammersmith by Filter with a cast including Poppy Miller, Romola Garai and Clare Dunne. In 2011, the play was adapted by Blake Morrison for Northern Broadsides as We Are Three Sisters, drawing out parallels with the lives of the Brontë sisters. In 2012, the play was staged at the Young Vic, directed by Benedict Andrews in his own new version. The cast included Vanessa Kirby, Mariah Gale and Sam Troughton. In 2014, the play was staged at the Southwark Playhouse, directed by Russell Bolam. The cast included Olivia Hallinan, Holliday Grainger and Paul McGann. In 2017, the play was staged at the Studio Theatre directed by Jackson Gay in conjunction with a modern adaption called No Sisters directed by Aaron Posner. In 2017, the play was staged by Sydney Theatre Company at the Drama Theatre, Sydney Opera House from 6 November — 16 December. The new adaptation was by Andrew Upton and the cast included Alison Bell as Olga, Miranda Daughtry as Irina and Harry Greenwood as Tusenbach. The Irish pop group The Divine Comedy referenced the play in their song of the same name on their 1993 album Liberation. In 2019, the play is being staged at the Almeida Theatre in London, with Alan Williams playing Ivan Romanovich Chebutykin. This page is based on the Wikipedia article Three Sisters (play); it is used under the Creative Commons Attribution-ShareAlike 3.0 Unported License (CC-BY-SA). You may redistribute it, verbatim or modified, providing that you comply with the terms of the CC-BY-SA.